Wake Up London are a group of young adults inspired by the peace work of the Buddhist teacher, poet and peace activist Thich Nhat Hanh. 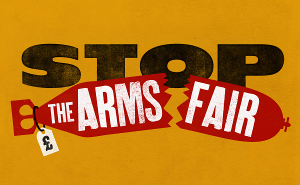 We will be present at the DSEI arms fair again this year to show our belief in peace and a more compassionate world. The Wake Up movement began around 10 years ago as part of what was already a well established international community of Plum Village mindfulness practitioners – let us explain what that means. The practice of mindfulness, of being aware of the present moment through meditation, is a teaching of Buddhism that Thich Nhat Hanh has developed into practices for living mindfully. Anyone wishing to join others for a shared experience of these practices can visit Plum Village, Thich Nhat Hanh’s monastery in France, or go to a local group. Wake Up London is one of these. We meet regularly as a community sharing the practices of sitting and walking meditation, listening to teachings and sharing our own life experiences with one another. We also hold events: film, music and poetry nights and retreats and have lead many public meditation flashmobs all inspired by our wish to build a more peaceful world. Thich Nhat Hanh became known to the world for being involved in war relief work during the Vietnam War. These efforts were recognised by Martin Luther King who brought him to America to share his insights and nominated him for the Nobel Peace Prize. On Tuesday the 5th of May, for the ‘No Faith In War‘ day, we will be leading a 30 minute guided Peace Sit meditation at DSEI. All are warmly welcome to join us. We will also be part of the Big Day of Action on Saturday 9th September. For more of Wake Up London you can visit our website here: wakeuplondon.org.